100 Gigabytes of on-demand stream delivery for $59 a month! Your choice of streaming format, 100GB of delivery bandwidth, and 1000MB of distributed and mirrored storage for your valuable audio and video on our ultra-high performance Content Delivery Network, the industry’s best stats and reporting, and our awesome support team. Need a Video Player? 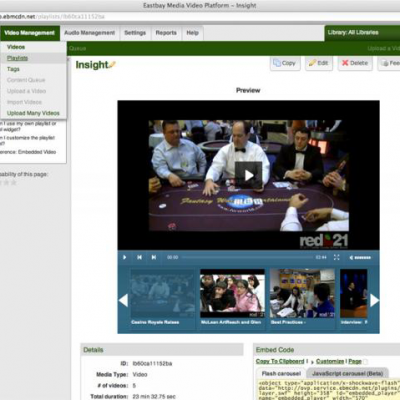 All accounts include use of our enterprise-licensed JW Player with native HTML5 Playback. Call us at 888-227-7103 or email today! Want to see how a true world-class Content Distribution Network can improve your streaming media performance – but don’t want to mess with costly committments or expensive annual contracts? Stream on the same network that provides streaming services for the Department of Defense, Duke University, Fox, NOVA, State of Virginia, TTV , Navy/Marine Corps, WETA-TV and many others. Our new multi-protocol streaming service enables you to publish a single video and be able to stream it to Apple, Android, many Blackberry devices, as well as regular web browsers using each device’s native media playback capability. Supporting HTML5, Apple Adaptive HTTP (live and on-demand) streaming to iPhone/iPad, RTSP, and RTMP for Flash. For live video or audio streams, we can support the same devices and are doing it today for several of our cutting edge clients. This service is available to our existing customers at no additional cost. Ask your account manager today, or Contact Us for more information. Contact Us for your free trial. Because of our re-architected two-tier distribution network, we are only of the only major streaming network providers that have enabled the new “push” features of Windows Media Services 9 on our network. With Windows Media Push, you can send a live stream from any Windows Media encoder behind a firewall, NAT, or DHCP server. The only requirements are that you have enough bandwidth for the size stream you want to deliver and access to HTTP port 80. 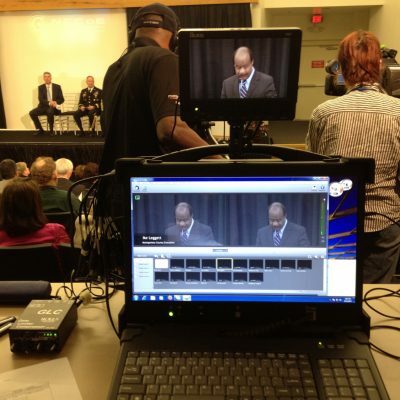 Windows Media Push has great benefits for the webcaster-on-the-go. But it also have a few drawbacks from the more conventional “pull” method. We don’t recommend Windows Media Push for 24/7 webcasts, long events, or super mission-critical situations. Give us a call and we’d be happy to explain the differences and help you decide which method is right for your needs. We frequently work with government and institutional clients either directly, or as a subcontractor through one of our Systems Integrator partners. Our services and solutions can be purchased through several contract vehicles and methods such as GSA, 8(a), and MBE. Through excellent service, the right offerings, happy customers, and worth-of-mouth; we have earned the trust of many prestigious colleges, universities, and non-profit institutions. We understand the needs and requirements of institutions large and small and can create a customized service offering to meet your institution's specific needs. Whether it's a college radio station, a commencement ceremony, a press briefing, or a faculty lecture - we are here for you.